Today, we will butcher a couple of pigs. The weather isn’t the best for woodcutting, so I will switch gears. It will be nice to have the fresh meat. I also plan to make some summer sausage and a few other meat treats to be eaten over the holidays. The smokehouse will soon be filled with all sorts of yummy treats. The best thing about butchering this year, will be using the new slaughterhouse… no more working outside! 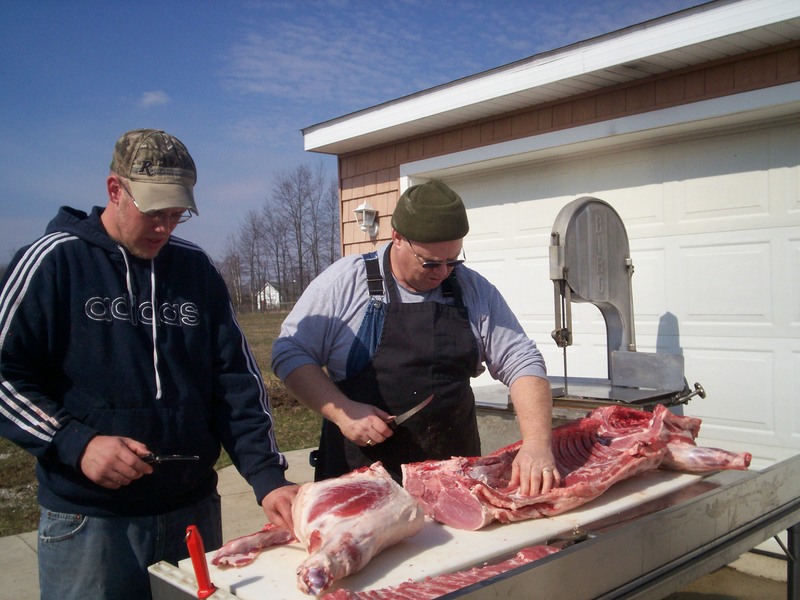 We do the killing, skinning and gutting part of the job outside, but the job of cutting the meat, making sausage and preparing hams and bacons will now all be done inside. The big sink and hot and cold running water will be a welcomed addition. It is so nice to be able to wash hands and equipment any time you want to do it…and without a bucket of water! I will stretch this work out over the next few days. The smokehouse will run by the end of the week and even in to next week as we smoke the hams and bacons. It is a wonderful time of year. The tree is mostly trimmed. Rows of cookies line the table. A few wrapped packages are under the tree and now the harvest for our freezer is underway. Yes, I like butchering day.